No kidding,,, I am serious! 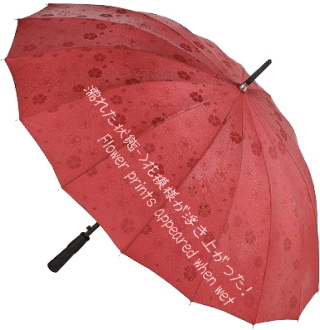 When the umbrella gets wet, Sakura patterns appear! Isn’t it amazing? Apparently the Japanese who came up with this idea, thinks that an umbrella should not STAY as a useful tool only. 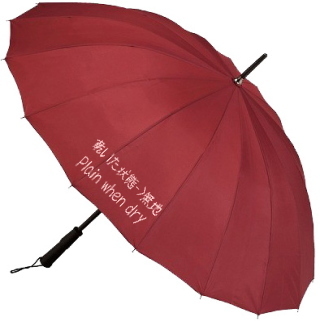 A few interesting yet playful touches is needed for an umbrella, hence the “Sakura Mechanism” was born. Other than Sakuras, cute prints like Disney characters, animals are showing up. Bet rainy seasons is going to be twice the fun with it! Stumbled upon this interesting product in one of the sites. 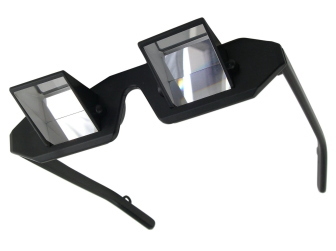 Can you imagine what this is for from the irregular shape of the protruding glasses? Couldn’t comment on how useful it is since I had never tried on it before. But just one thing… I wish there are some efforts put into the design though… something that looks cute or cool would be nice in my opinion. Such an order came from customer. “I need three of each ketchup and mayonnaise”. Eh?? Why order from Japan? I mean these should be easily found anywhere ?(‘_.)?(._’)? 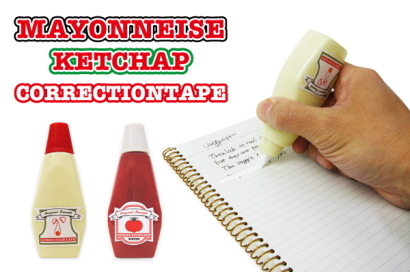 is no more than a correction tape! (LOL). Apparently whoever designed this decided that he needs some interesting, creative correction tapes apart from those prim, boring ones in the market. The bottle and even the cap! The entire packaging was made to be as close as possible to the original items. How on earth did the customer find such these??? Anyway,,, it is time to prepare a quotation. Is Christmas tree really for decorations only? How about Christmas trees showing up on the dinning table? Flaky pie crust is the pillar to the Christmas tree shape solution. A whole luxurious three types of berries, namely strawberries, raspberries and blueberries are laid as toppings. Custard cream mixed with pear pieces filled in between the crusts. 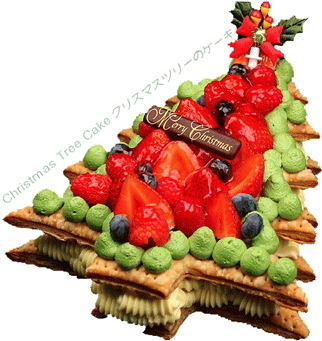 Yummy~~ How is the idea about a Christmas tree shape cake? This cake is picked up from online cake shop “Organic cyber store” and priced at 4,500 for one. Ever wish that you have just a All In One handy bag that won’t feel out of place for whatever occasions your bring? Japanese brand, Samantha Thavasa might just have the answer for it. A collaboration project between Japan’s morning show and Samantha Thavasa itself, the “DREAM Bag” was born with seeking and combining opinions from female guest commentators, on what their ideas of a DREAM bag should be like. 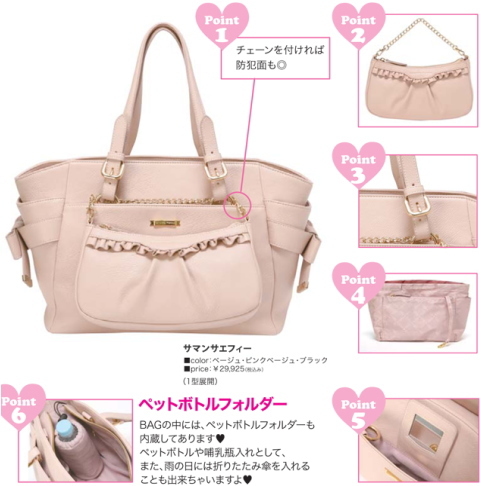 Besides the “kawaii” design, the bag was filled with wonderful ideas from all the six female guests. I picked up a few of the selling points. Do ideas like such echo your very own? 1. A mini bag that can bring for lunch or even use for events like party. 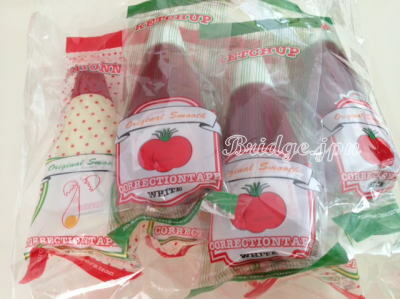 (Solution) The design that comes with a detachable cute mini bag “child” that can be used on its own or as a set. 2. Should length could be lengthen or shortened. (Solution) Design with adjustable handle strap. 3. I can’t seem to organize my things. Bag interior is always messy. (Solution) An internal pouch like bag is added for keeping messy things out of sight. They have this interesting term in Japan, “BAG in BAG”. 4. Able to check myself in the mirror in the train, escaping the eyes of other commuters. 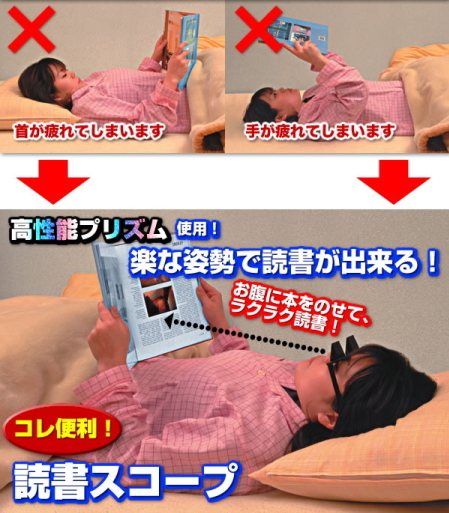 (Solution) A flippable mirror attached to the front pocket. 5. Cold drinks or wet umbrella can be dumped into the bag at ease. (Solution) Special built-in holder for pet bottle holder or umbrella use. 6. It will be good to be used as shoulder bag occasionally. (Solution) Shoulder bag strap comes as set. As from 22nd-Nov, Samantha Thasava started accepting pre-orders online. Please inquire through the below button for more details. Japanese had created countless innovative products that never ceased to amaze the world. Making news headline now is the renown environmental friendly “Stapleless Stapler”. This is another jaw dropping product originated by Japan. What is so amazing about “Stapleless Stapler”? Have you ever heard of a stapler that works without bullet? And so this one does. So the next question comes. Why is it making headline only now? By chance, International Monetary Fund Meeting was held in Tokyo last month. And it happened that “stapleless stapler” was distributed to representatives of each countries. The representative were so full of praises for the stapler after using it seems. The bullet free feature is highly evaluated as it is environmental & user friendly and consider very safe even for children. 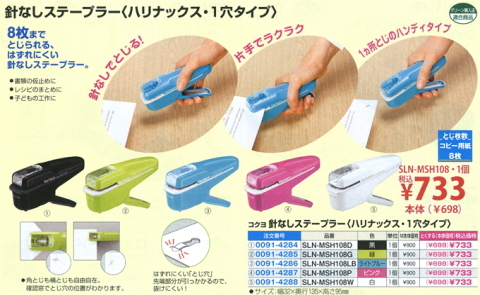 Besides, famous Japanese stationary maker, “kokuyo” had put in continuous efforts to improve the stapler over the years. Efforts were tremendous, but they got paid off. 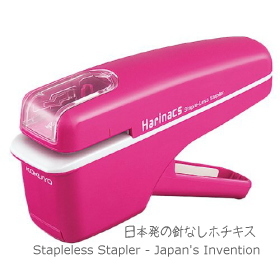 Compared to traditional stapleless stapler that allows only 3~4 pieces of papers, latest allows up to 10 pieces (*o*)!! The stapler cuts holes on the papers and then join them by weaving the paper pieces made through hole cutting. Insomniacs longing for a good night’s rest might be glad that “Hug & Dream Minnie Mouse”, a soft toy will start selling on the market from November. 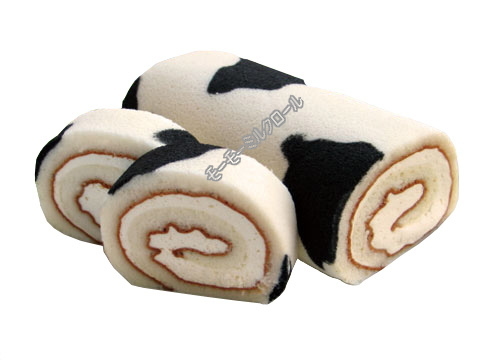 Unlike ordinary toys, this one has the effect to comfort and soothes one to sleep. 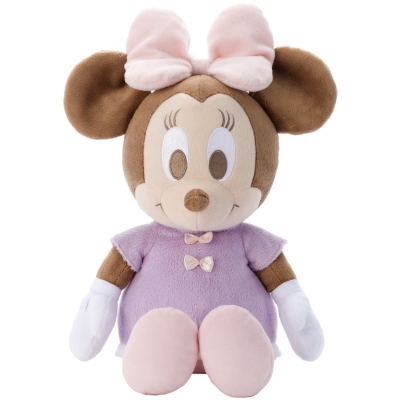 “Hug & Dream Minnie Mouse”, is a collaboration work between Japanese toymaker Takara Tomy and cognitive & respiratory specialist from Showa University School of Medicine. Minnie is fitted with a mechanism mimicking the breathing pattern of human. She “breathes in” once every 5 seconds. While hugging her, the rhythm breathing is expected to calm and soothes and naturally induces one to sleep. She came with a melody option where you can turn it on if you find that having the music is more relaxed. And it even came with an auto sleep function in which breathing motion is automatically switched off after certain time. 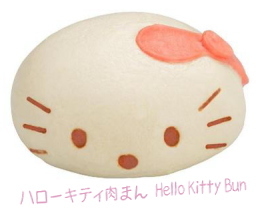 Now, Hello kitty makes her appearance in postage stamps (*o*)!! 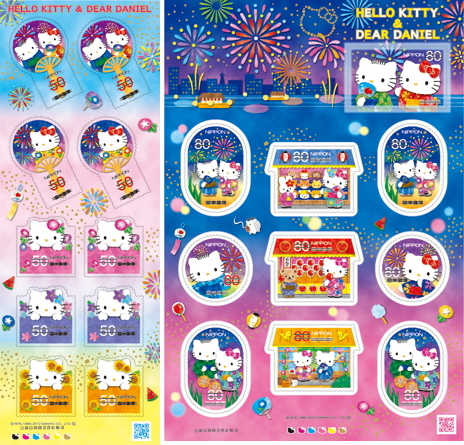 For the past few summers (this year too), Hello Kitty and her childhood friend, “Dear Daniel” became regular team members of “greeting stamps” released by Japan post. “Greeting stamps” are to meant to promote the exchange of letters, postcards during summers. 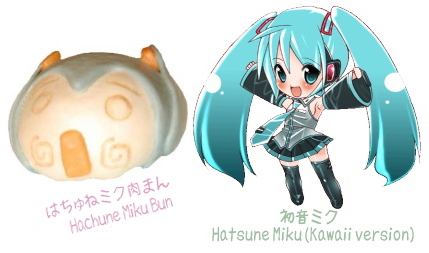 Kitty is so popular in Japan that she has become part of the daily life, appearing in electronic goods, utensils, accessories, etc. I couldn’t believe my luck that one of the Hello Kitty stamps turned up at my postbox. 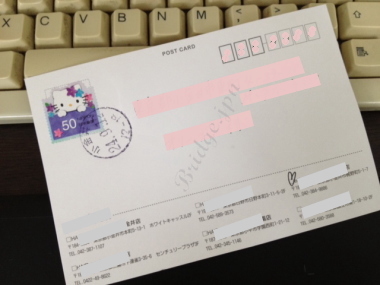 The hair salon that I visited for the first time last week, sent a greeting card with the cute Kitty stamp affixed and that was how I got it! But popular characters aren’t the only ones showing up on stamps. Hero & heroine of famous Japanese anime are getting a place too, taking turns to show up in special edition postage stamps. 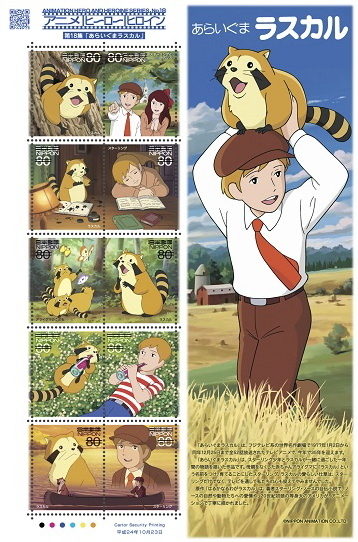 Postage stamps featuring anime “Rascal the Raccoon”, will be released this October. And Wow! Looking at the stamps alone brought back wonderful recollections of the anime. Over the years, Japan has produced many old yet meaningful and excellent anime that touched many hearts. And it is a wonderful idea that memories of such beautiful, famous works could be recap once again through the use of stamps in my opinion.